We purchased a Staunton Chess Set from the “Regency Chess Company”. My initial requirement was an average quality chess set with larger than normal chess pieces, a board and a storage box for the set. I got a LOT more than I bargained for from this fantastic chess company. 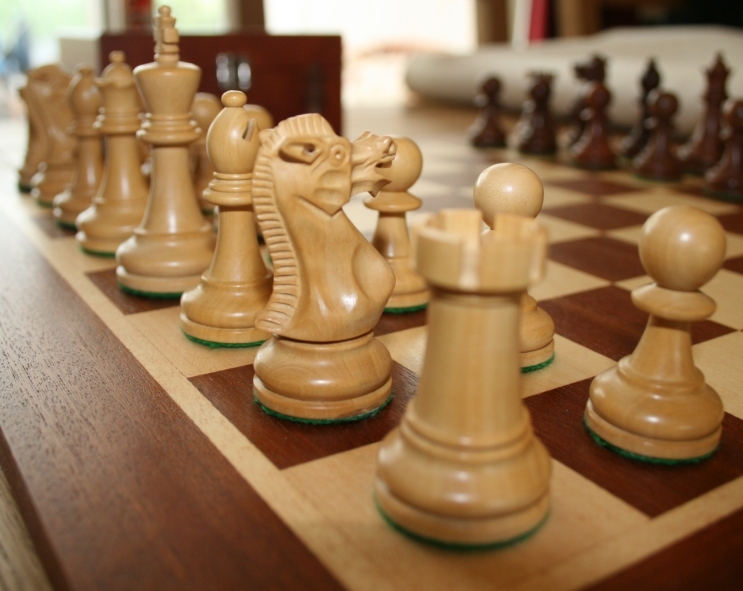 Having played the game of chess periodically for most of my life – since I was around 7 years old, I was eager to teach my own kids the intricacies of this fabulous game – indeed one of the very few games (if any) that I know of which relies on pure skill rather than the throw of a dice. Knocking around the house I had a couple of old chess sets and in terms of the pieces – I even still have the set (but not the board) which I actually learned to play with almost 40 years ago – a feat of safe storage I am somewhat proud of! I digress. I didn’t have a fortune to spend – my budget was set around the £100 mark, but I wanted something “chunky” with a bit of weight to the pieces – my old set has very small pieces (i’m still proud to have it though!) so I was looking to “upgrade” if you like. I wanted to convey a sense of importance of the game to my kids, rather than having them move fiddly little bits around a board – like in monoply – I want them to “focus”. I searched the internet for days on and off – there are plenty of places to buy from – then I came across the Regency Chess Company. 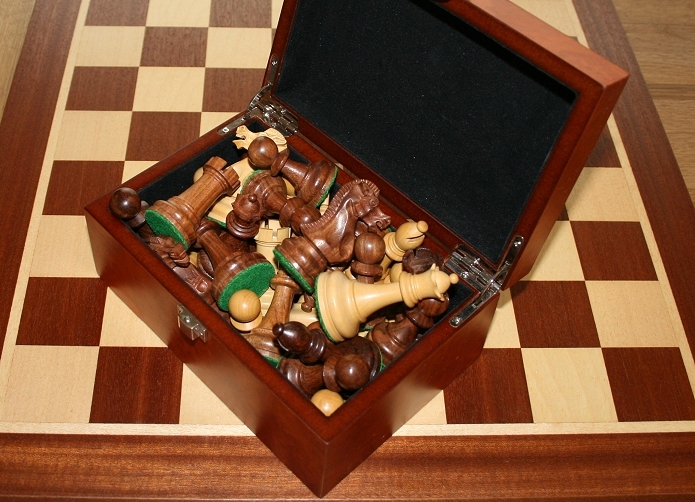 They have a huge variety of wooden and metal chess sets to choose from, many are stunningly beautiful and carved to perfection with incredible detail and ultra high polished finish – but sadly for me – out of my price range in truth, and if I am honest – out of my level of skill – if you consider that a top level player should deserve the very best and most expensive set! I am mediocre at best – with fools mate being just about the only standard check mate I can think of – everything else is off the cuff. 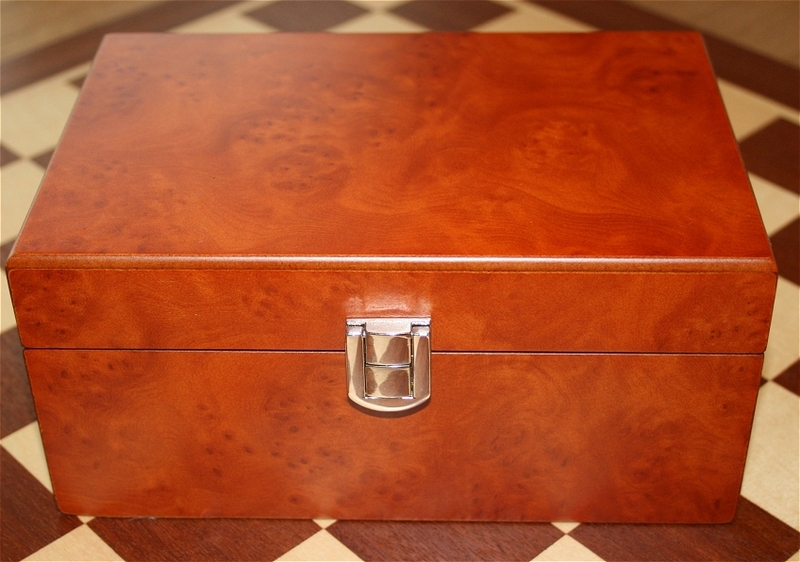 My choice was to go for a mahogany set rather than the (perhaps) more traditional black and white, again, I see the mahogany as more attractive looking and somehow creating a richer, potentially more important or serious feel to my young apprentices! The set I chose was a Staunton type from Regency – it was offered as a set of pieces and I had the option to choose a board which I felt would go with them. I measured up on paper how large the bases were, and how large I perceived I would need the squares on the board to be to accommodate them with comfortable room to maneuver them without knocking the others over. The company had a range of boards which met the size requirement, and I was also able to choose a board with the colour I wanted. Here is the outcome of my research within my allowance. Lets take a closer look at what I have purchased – and bear in mind – the total price for this was around £80 – I think you may be impressed!!! My old box was broken, so the set is in a plastic bag within the broken box! I wanted a box which would last a lifetime and without being morbid, something as a part of the set as a whole I could “leave behind” (hopefully thats a long way off yet). As you can see, there is a clasp on the front of the box which allows the lid to be held firmly in place during storage. The clasp is made of metal, firm, sprung and not some cheap nasty photographic trick you get from some sellers. Below is the close up shot of the box hinge, you can see it is metal again, there is a hinge on either side of the lid fastened securely with multiple philips screws. When you open the top, there is no play whatsoever. My only gripe was that I should really have chosen a larger box for the set I decided to buy, the full set does fit inside, but I have to position each individual piece otherwise the lid will not close, and the last thing I want is to break the Kings crown by pressing down too hard with him sticking his head up! Is this a fault of the Regency Chess Company? Absolutely NOT!!! It is my fault for choosing a lower priced smaller box – and thats all there is to it. The company offers the box in larger sizes and I went for the minimum to keep costs down. 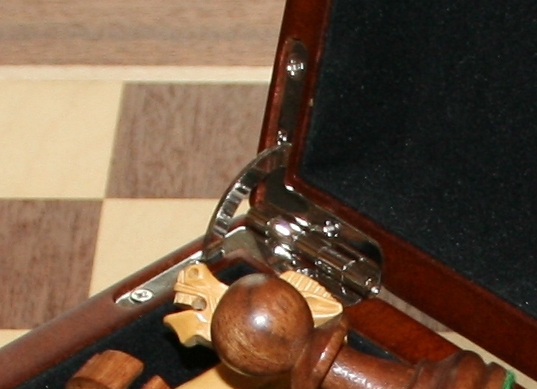 The Chess Board from the Regency Chess Company. I did not really want a folding board, whilst it would have been handy for putting away, I wanted to play on a flat board with no fold and no gap. I chose the board based on three factors. Colour, Size, Quality. The board is thick, heavy and sturdy. 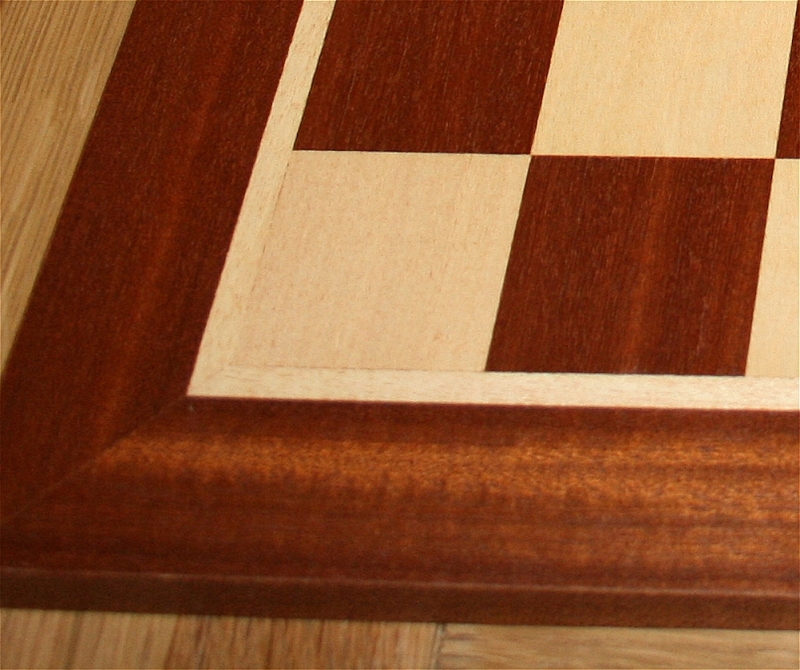 The squares are perfectly inlaid and surrounded by a white wood border and an extended mahogany border. My personal preference is to have a very heavily varnished finish which gives depth and reflection, however this one is thinly varnished and for the purpose I would say it is perfect for playing on rather than ornamental. I am 100% pleased with it. The closeup image below shows how much care and attention has gone into producing these boards. In addition to this, beneath the board there is a circular felt pad in each corner of the square to protect your table. I store the board flat to avoid warping – in terms of how it arrived it has no warp detectable – this is how I want to keep it. 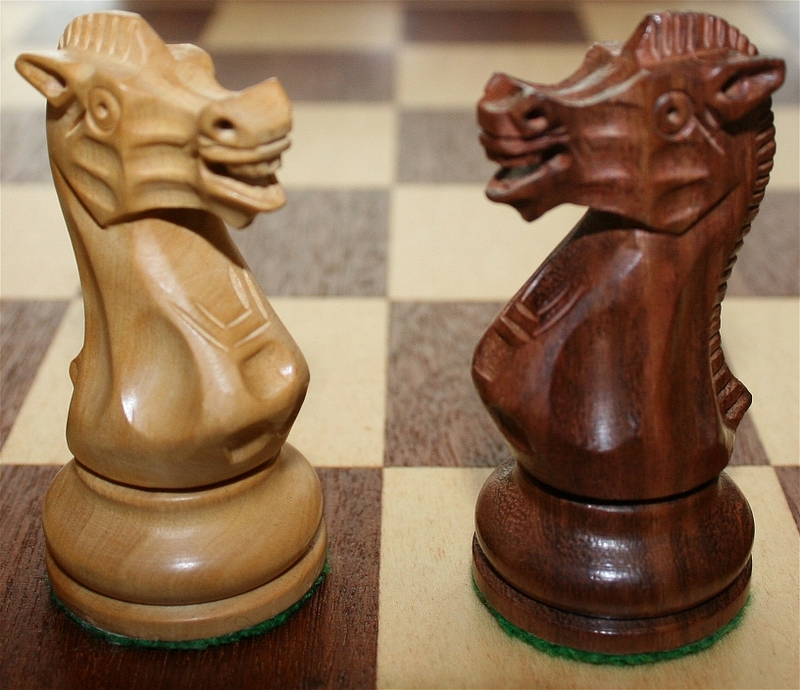 The Staunton Chess Set Pieces from Regency. And now for the pieces themselves. Within my price range, I could not have asked for more. The weight and quality of every single piece is exactly what I was looking for. 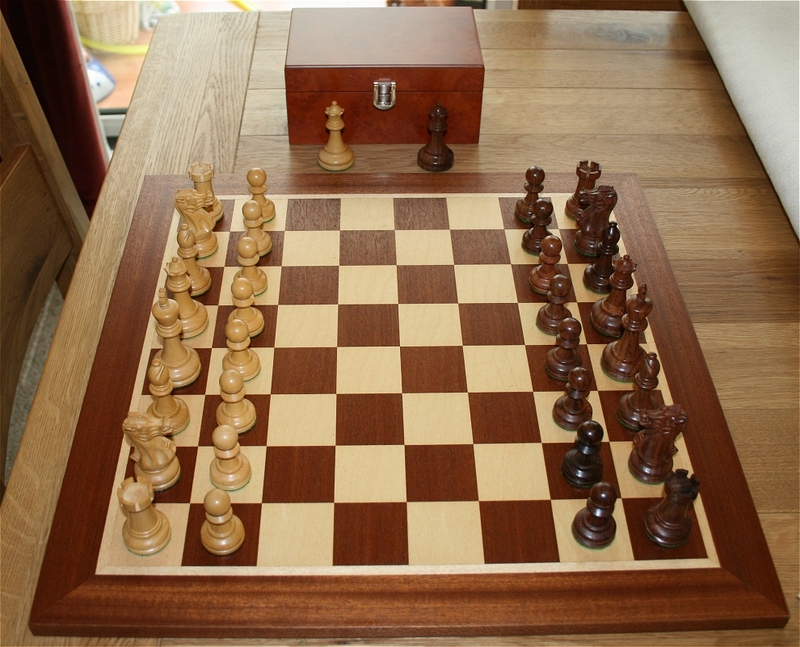 The colour is ideal for the board with great contrast which makes the pieces of the chess set stand out clearly. Each character is padded on the underside with a perfectly cut and fixed felt pad, as you place the piece down onto the board, it “thuds” with its weight and stands firmly in place. When you move one of these, you know you have “moved”. The knight is perhaps the most detailed in its carving, bearing its teeth with a wicked grin as it moves into battle! The black and white full Staunton set is displayed below, you will notice that the wood grain in each piece is enhanced and stands out beautifully, making each one unique in appearance whilst still clearly maintaining consistency at a more than acceptable level. Stunning. You will also notice in the background of the black “team” there is an extra Queen. 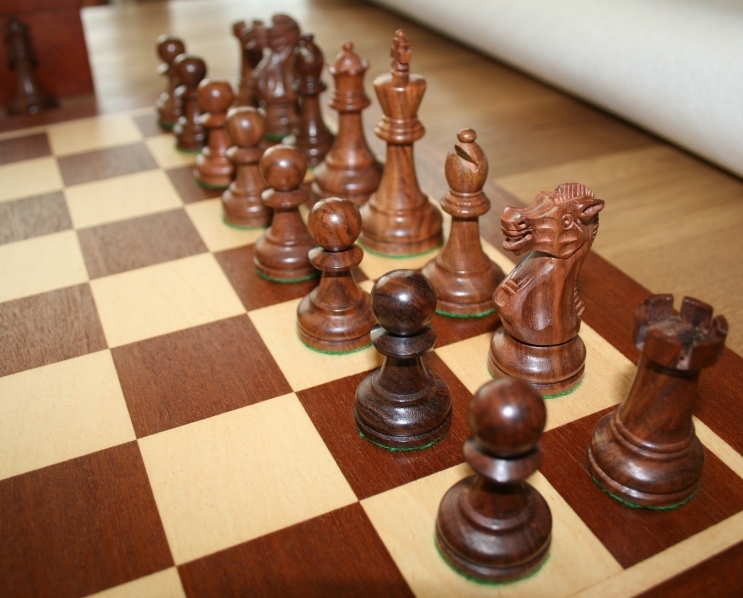 This applies for both black and white, so should a pawn reach the other side, a second Queen can be placed on the board as the Pawn is promoted. The King has the cross on his crown and the Queen is adorned with a pointed crown. The Bishops have a standard slot cut and even this is prominent and defines his position well. Castles (Rooks) are tapered towards the top and finished with Six battlements. Each has a turned base with a basic yet attractive pattern – they are wide in diameter and there is little or no chance of them falling over – even when knocked by a worried hand! In the final picture above, the chessboard is set up and ready to play. I would say that there aren’t many players out there who wouldn’t be proud to own a set like this and the Regency Chess Company has done the game some serious justice with this offering – not to mention its luxury sets. For me, this IS a luxury chess set, one which I enjoy many games with and I couldn’t be more pleased. If you need to get a chess set, I would strongly recommend you search out “Regency Chess Company” on google and visit their website, because whilst this style is my own preferred type, there are many other options and variants available – something for everyone for certain. 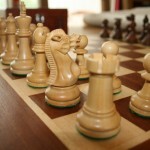 If I ever need another chess set – I would definitely buy from them again. - Nothing on the Downside. Flava-it Marinades in Chinese and Garden Mint. Apple iPhone Charger Plug Volts for Mains Power Connection.